Alas, I bring to thee a new 21st century marvel: Anonymity. See I love the internet. I love it’s power, influence, gauge, speed, and more importantly the inherent aptitude it supplies its users with. We have access to thousands of resources and articles which make today’s physical library comparable to a scene out of the Star Trek series (which may I add is completely horrendous and not of the caliber of the STAR WARS franchise). I digress. THIS IS YOUR NEW ENEMY, AMERICA! Robbers, criminals, thieves, rapists, no no these characters my friends are things of the past. Todays villain, is Mr. Anonymous. Equipped with computer software to block his IP address, several fake names and sign on IDs to mask his true identity, bold enough to speak preposterous statements that may cause Earth’s center of gravity to fall out of line…..YES, this is our enemy. The same freedom that lets me write this here blog is the same freedom that let’s John Smith rant through Social Media about his disgust for anything that isn’t the color white (even though clearly this is self hate at it’s finest since no human is technically the color white, again I digress). At least with my rants and public spiels, theres an ID to it. A face, a name, a email address. John Smith however, creates his own persona, using fake names and IDs to hide his true identity, therefore giving him a renewed sense of confidence as to what he will let his brain think and mouth speak. Clearly, his first amendments rights mean THAT much more to him now that he can REALLY say whatever he wants to say. Cowardly does not describe this man, ashamed would better serve him. He wages war with other online political activists, all of whom hidden beneath charades of illiterate buffoonery. All in all, I would love to see this new culture dissipate. Why is everyone scared to use their real identity? Fear the omnipresent Federal Government will track you down and hold you accountable, with 17th century anti-heretic charges brought against you? 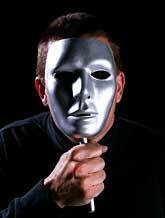 Fear another hidden identity will seek you out and look to cause bodily harm based on your views expressed? It becomes dangerous when no one appreciates their identity anymore. Imagine MLK going about his fight for equal rights under a pseudonym and not his birth name. Would it have been as impactful? Would anyone really have cared? Ditch the false names and be really brage: use your real name. If you are a self proclaimed descendant from Hitler himself, be that. Show us that confederate flag as you switch your hips in the street. Show us you are both a bigoted homosexual racist so we can know your true confused identity.